On 20 July, 1969, the NASA Apollo 11 mission, commanded by Neil Armstrong, landed on the moon. Spoiler alert. But, I mean, it did, and that's why we're here for a movie like First Man to begin with. "First man to almost walk on the moon but then not do it" isn't a plot. So anyway, they made it to the moon, and God forbid anybody somehow doesn't know that when they go to see First Man, and this is how I know the film is a genius thriller: it convinced me, absolutely convinced me down to the tips of my toes, that Armstrong (Ryan Gosling) and Edwin "Buzz" Aldrin (Corey Stoll) were going to run out of fuel and their Lunar Module was going to fall into a crater and rupture and they would die the most miserable deaths in the history of humankind. The Apollo 11 moon landing is the third time in the film that Armstrong has been in space (or near to it). The first time, opening the movie, was one of his flights during the high-altitude X-15 program, when the civilian pilot flew to the utmost limits of the upper atmosphere, and only managed to survive the return trip by remaining deeply level-headed in a moment of confusion. The second is the Gemini 8 flight of 16 March, 1966, which suffered the first critical in-flight equipment failure of an American mission in outer space; Armstrong and Dave Scott (Christopher Abbott) only managed to survive because Armstrong remained deeply level-headed in a moment of pure chaos. I will allow you to guess what traits Armstrong exhibits when the LM almost runs out of fuel while a meaningless warning light keeps going off accidentally. These three sequences, which get longer and longer, tenser and tenser, are very obviously the main structural linchpins of First Man. 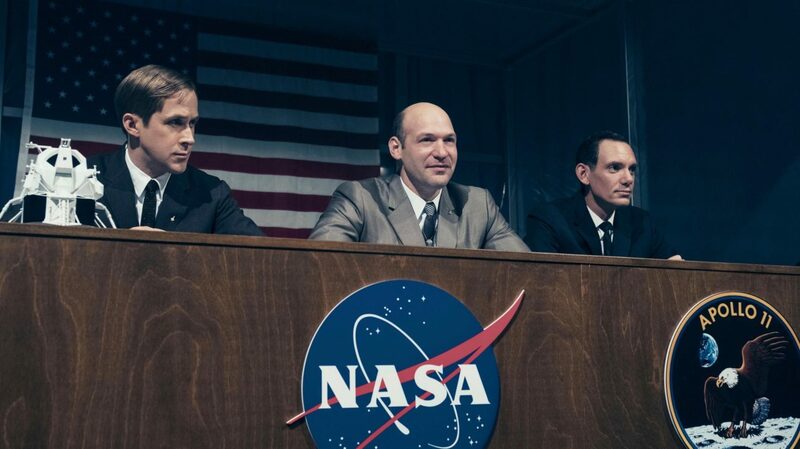 Also, First Man is a film for which one is inclined to discuss the screenplay's structural linchpins before getting to anything else: it is, by design and to great effect, a mechanical movie about mechanical processes, one in which director Damien Chazelle and writer Josh Singer are very eager to show off their craft rather than do much to rouse you into passion or bash you into emotional transport. Apollo 13 it's definitely not - and that's perfectly fine, I say, because we already have an Apollo 13, and we even have an Apollo 13-ified version of the Apollo 11 mission, sort of, as one of the episodes of the 1998 miniseries From the Earth to the Moon. What we have never gotten, that I can think of, is a movie about a real or fictional space mission that's as committed as First Man is to creating an extraordinary subjectivity, a you-are-there-ness that captures all the tension and terror of those three flights through a combination of screaming fast editing by Tom Cross, unnervingly close shots of faces, often just Armstrong's determined, wide eyes (superficially and certainly not by accident recalling 2001: A Space Odyssey), and Justin Horwitz's terrific score, which hammers out in minimalist rage, just about guaranteeing your heart rate is going to spike from listening to it, whatever else happens. The Apollo 11 flight is glorious - and the transition into pure beatific awe as Armstrong finds himself in the pure empty void is all the more sweeping for how sharply it contrasts with the preceding sequence - but the Gemini 8 sequence is the film's masterpiece, untethering itself from every anchor that might let the audience feel secure in any way just as the vessel starts spinning end-over-end in a frictionless vacuum. It is perhaps the most perfectly terrifying that outer space qua outer space has ever been - more even than in the star emptiness of Gravity, which still felt compelled to throw in debris fields and exploding space stations to gin up its drama. In between these three astonishing setpieces, First Man tells the story of, basically, not being in space. I'm not sure quite how else to put it. The film's great problem that it turns into its great strength is that, out of the 24 humans who flew in space as part of Apollo, Armstrong was almost certainly the least interesting and absolutely the most publicity-averse (he was, for example, the only living Apollo veteran who declined to be interviewed for the 2007 documentary In the Shadow of the Moon). A biopic of Armstrong would have very little chance of being interesting, and indeed the biopic parts of First Man pretty much aren't interesting: just a bunch of scenes strung together across seven years of Armstrong staring out at the world while his wife Janet (Claire Foy) struggles mightily to keep things together in her household despite a husband who has an incalculably dangerous job and remains emotionally detached from just about everything. Increasingly, over the course of the film's 141 minutes (more than it needs to make this or any other point), it starts to become clear that this rather tedious, unfocused waiting is the necessary counterpart to those amazingly intense flight scenes. First Man is a story about NASA in the the '60s, and it's a story about the mechanical process of putting together space missions, but it's the story of those things filtered entirely through the Armstrongs' perspective on things. This is, I think, the justification for the film's otherwise-annoying over-reliance on close-ups: it really does not want to ever leave Neil or Janet's heads (it does so occasionally for narrative purposes, and I think only its trip over to the fire that killed the three Apollo 1 astronauts, including Armstrong's friend Ed White (Jason Clarke), feels like a real cheat). The film therefore has two modes: pure body-encompassing terror as everything seems to go terribly wrong in complicated machines in the sky; and the antsy, impatient dragging feeling that comes from waiting around for the next blast of terror. The film's weird structure fits into this: time passes in blobby chunks, in which we see only fragments of Armstrong's life, presented through ellipsis and innuendo (even the critical character moment early on, in which his only daughter dies of brain cancer, is hidden inside a cut). Everything about the earthbound scenes is slippery and uncertain, time passing by without warning as Armstrong keeps himself cocooned in an expressionless bubble; just as everything in the spaceflights is presented in wearying real time, when we see the practical value of Armstrong's refusal to let himself fully give over to any real emotional expressions when he's being a "normal person". The film's aesthetic cleaves into two parts to reflect this, with the Earth scenes all shot in raggedy handheld 16mm cut languidly, and the space scenes in much crisper, cleaner cinematography (the Apollo 11 mission is shot in exquisitely clear 70mm, with the film's visual effects holding up perfectly under the strain of being just about the most visible thing in the picture), with a much more precise cutting scheme, frenzied in moments of chaos and stretched-out and floating in the more tranquil patches. The artistic upshot to this is considerable; the sad but almost certainly inevitable downside is that the domestic passages feel awfully chilly, with neither Gosling nor Foy really being invited to do more than inhabit contrary emotional states, and the film almost by design refusing to allow Gosling a character arc to play (this has unfortunate implications for the ostensible Big Emotional Climax on the moon: the movie has done not one blessed thing to earn it). "Character who remains unfeeling and aloof because it is the only way to deal with the extreme pressure weighing on him" is a valid, even necessary approach for this material, though it's not always the most fun thing to watch, and the filmmakers do not shy away from indulging themselves over their long running time. It does, at least, allow for a hell of a good final shot, one that contradicts and reinforces the emotional gap between the Armstrongs. And anyway, the film weaponises boredom: Neil feels a certain dreariness in the years between missions, and so do we, and that is the whole of the movie. Without valorising Armstrong and NASA, and without ironically cutting them down, First Man addresses itself to one straightforward question: what must it be like to be the human upon whom so much history single-handedly weighed down? It must have sucked a little bit, is the answer, and it's impressive how that single thematic line allows the movie to justify so many of its apparent flaws.